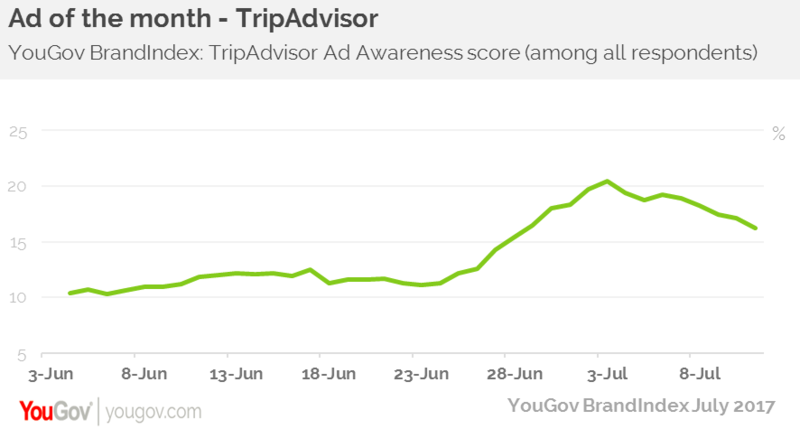 This month, TripAdvisor is the brand that has achieved the greatest uplift in its Ad Awareness score (whether someone has seen its advert in the past two weeks). YouGov brand tracking data underlines how successful TripAdvisor’s new advertising campaign has been. The series of ads, created by US agency Supermoon, forms the new ‘Little Wiser’ campaign featuring Ollie the Owl, their bathrobe-clad spokesperson. The series of 10, 20 and 30 second long videos focusses on the hotel booking function of the travel site. It marks TripAdvisor’s first return to TV since the ‘don’t just visit’ campaign, which ran at the end of 2014. The first ad in the series has been well received, with TripAdvisor’s Ad Awareness score spiking 11 percentage points, from 10 to 21 in just a month. The company can also be confident that they are achieving cut through with their target audience, with their Ad Awareness score rising to 24 among those who are most likely to use a travel or leisure service in the next 12 months. Not only that, but the site’s Impression score has increased from +24 to +28 over the past week, along with its Value score, which has risen from +9 to +12 since the campaign was released on the 20th June. In terms of competitor rankings, TripAdvisor sits comfortably at the top, showing the biggest uplift in Ad Awareness of all its travel booking counterparts over the last month. One of the aims of the campaign is to move perception away from TripAdvisor simply being a ratings and review site, and ultimately to raise awareness of the price comparison tool. The figures show that they have already been successful in doing so, and they will be looking to keep up the positive perception when rolling out the rest of their campaign ads throughout the coming months.